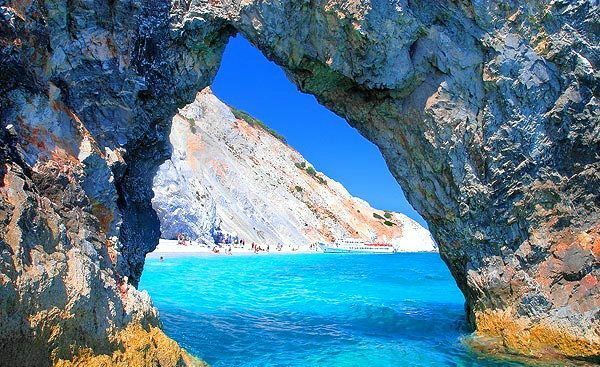 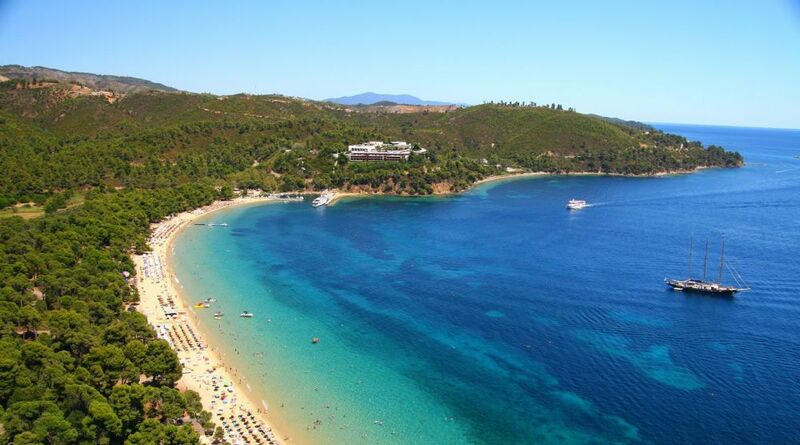 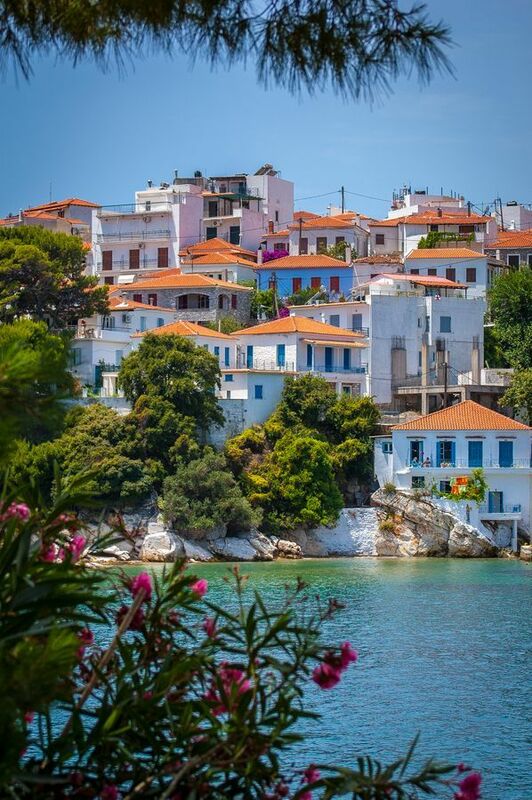 Skiathos, probably the most cosmopolitan island in the Northern Sporades, every year attracts thousands of visitors. 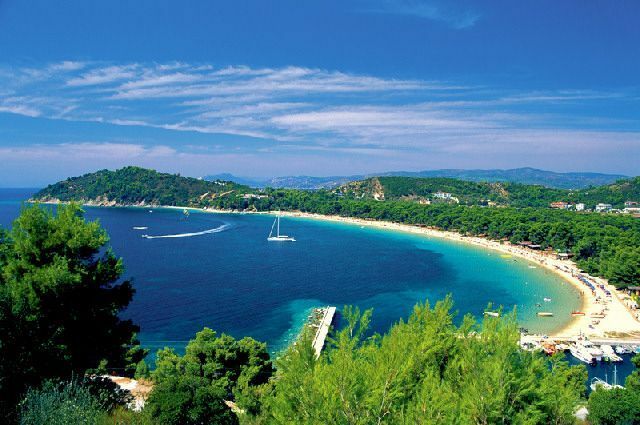 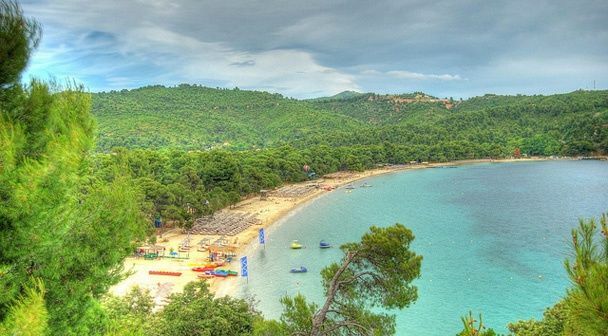 Very picturesque it is covered with lush pine forests and has more than 60 beaches with crystal-clear azure waters. 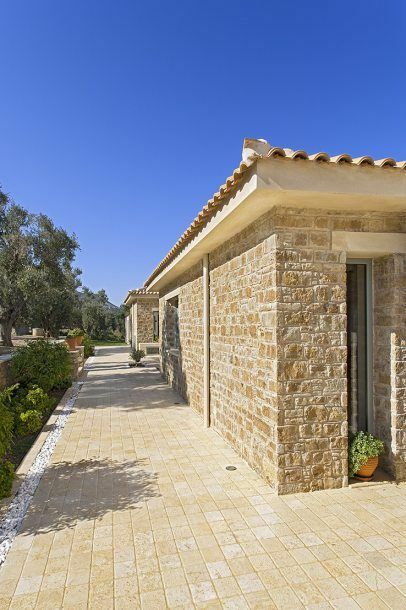 Among hundreds of accommodation options, there is a nice private complex, hidden in the olive groves - perfect for family vacations. 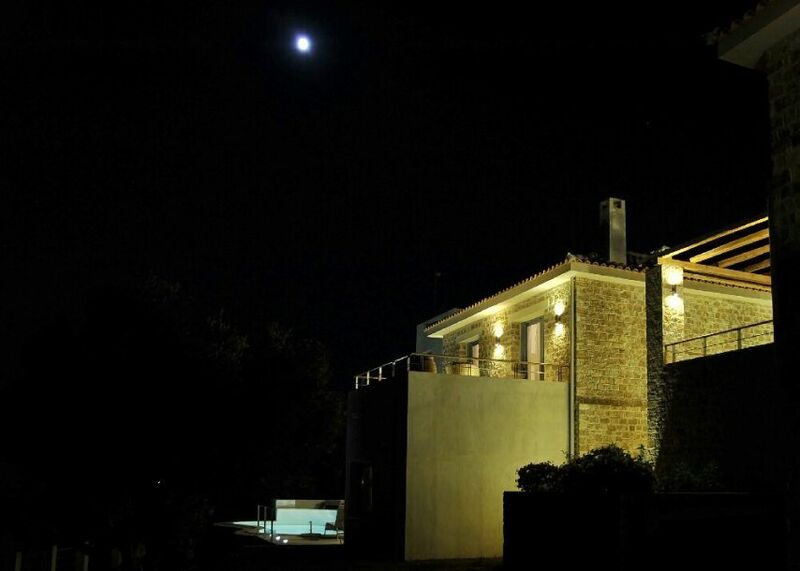 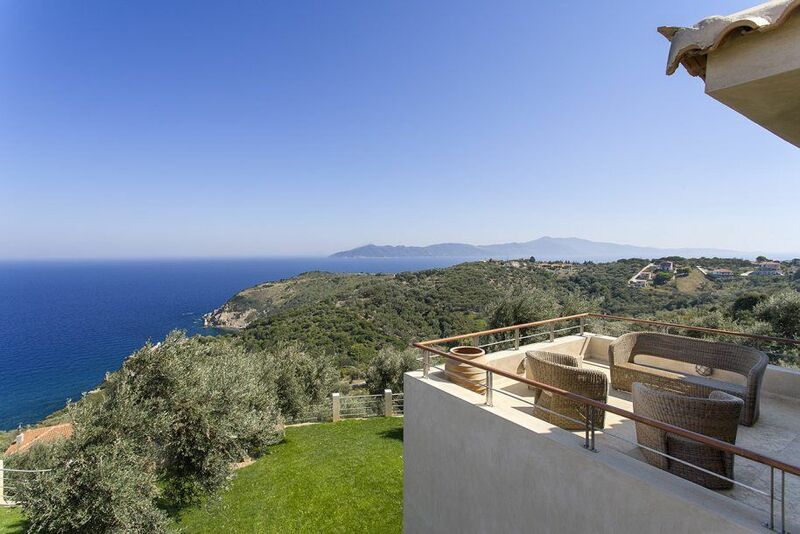 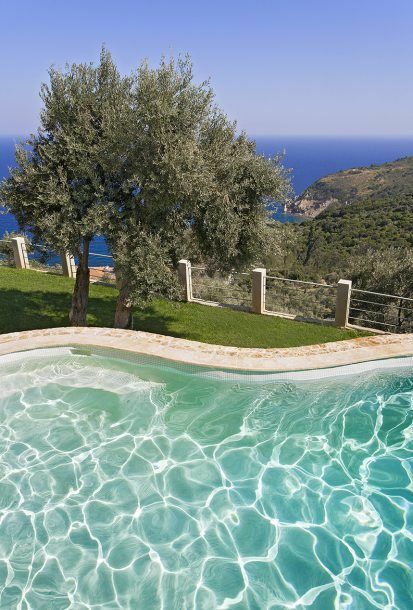 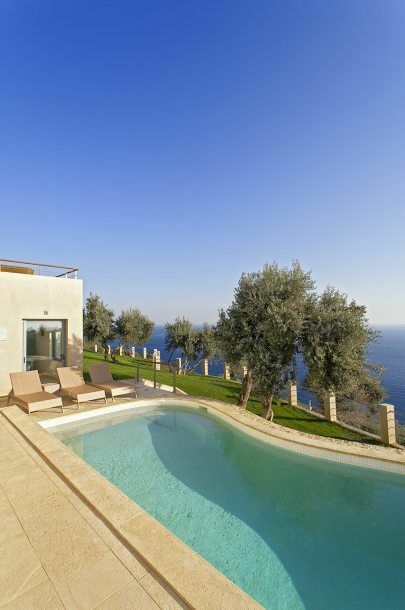 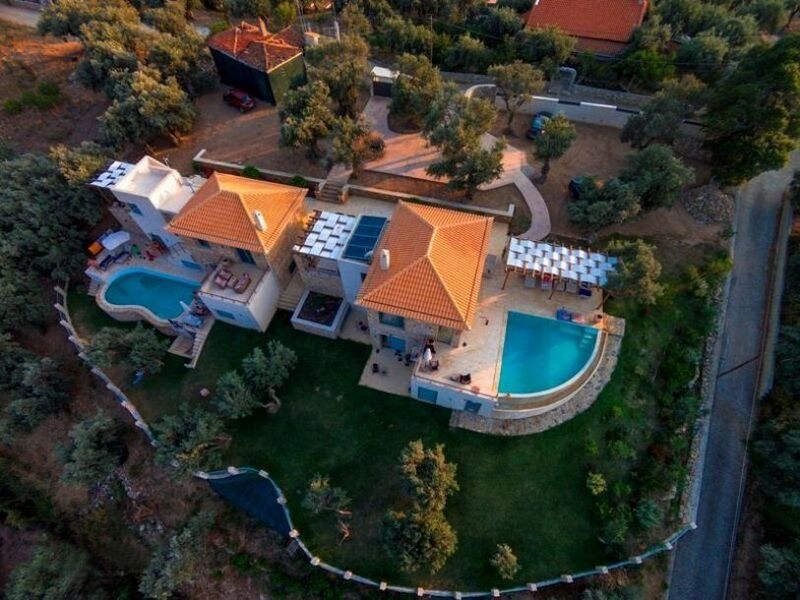 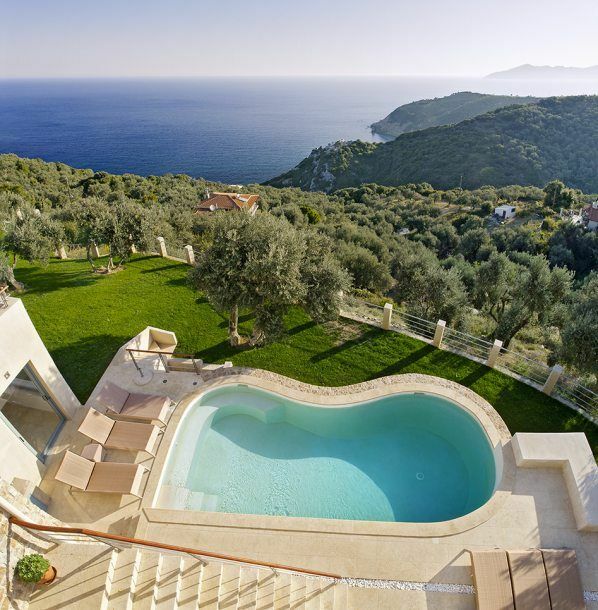 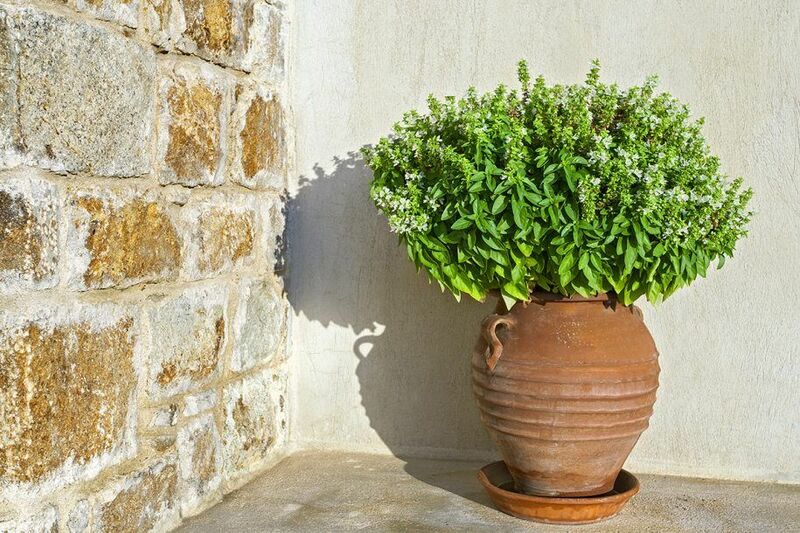 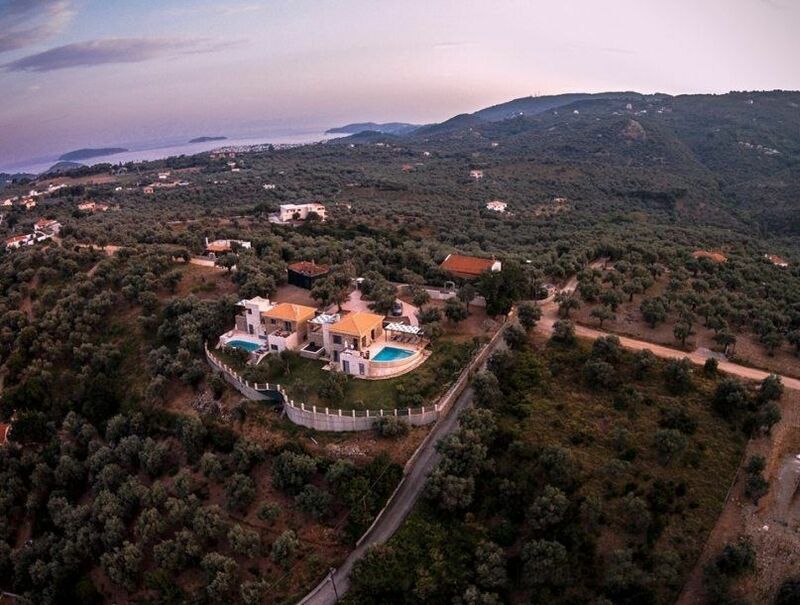 Ideal for those, who seek privacy and enjoy Greek living experience. 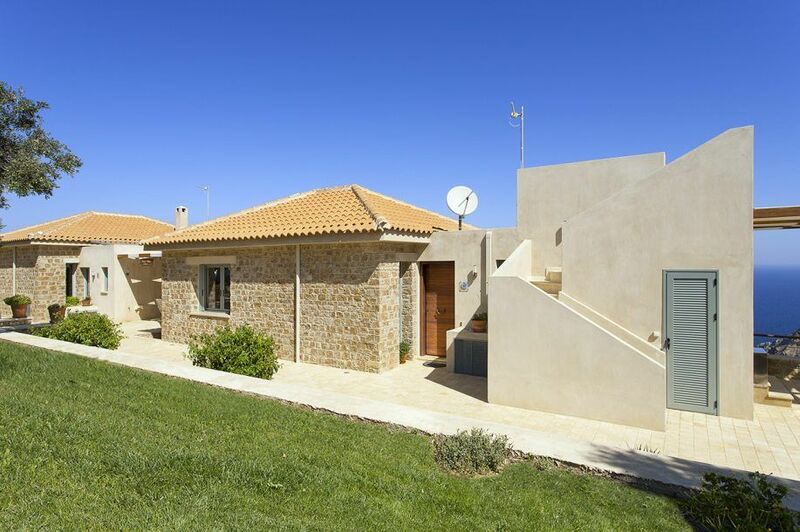 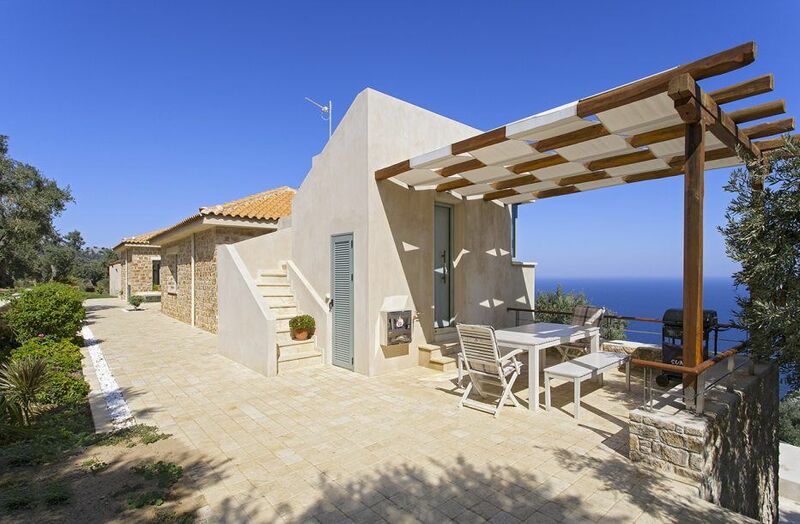 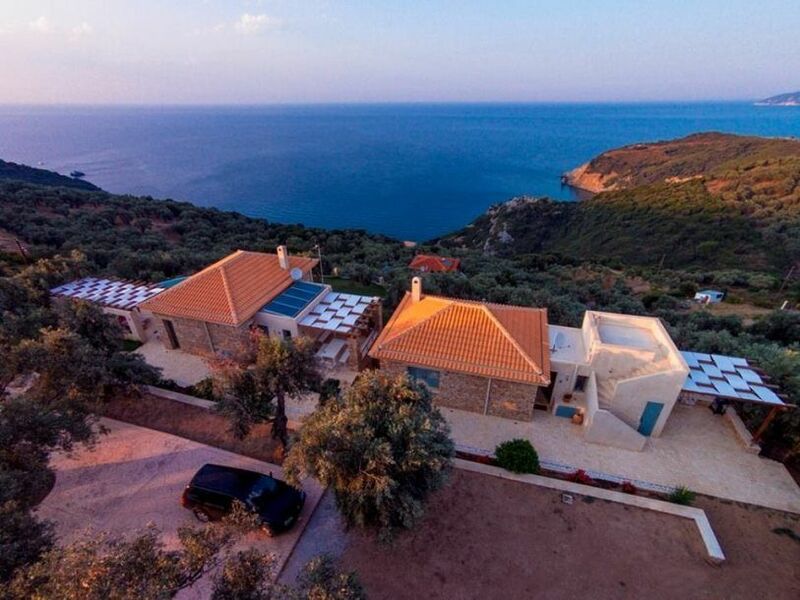 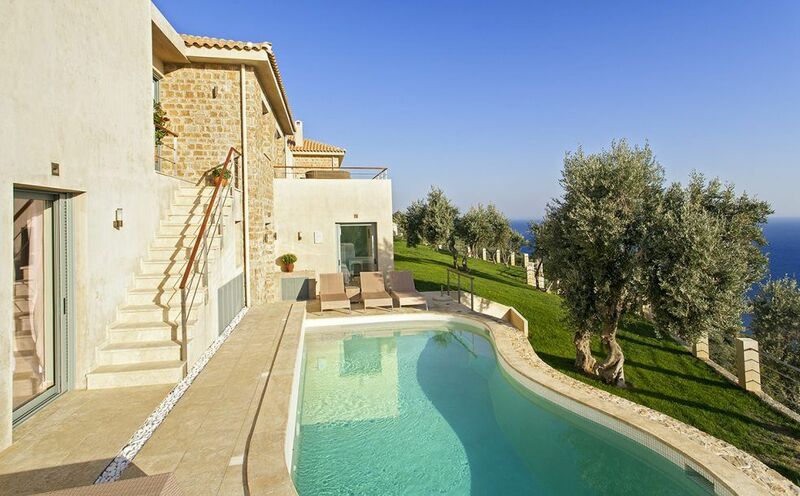 These two charming villas (SKT001, SKT002) stand on the north side of the island, on a large plot next to each other and could be rented together or separately. 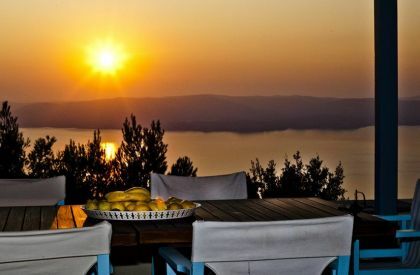 They guarantee ultimate comfort with the beautiful surroundings and magnificent view over the Aegean and the island of Skopelos. 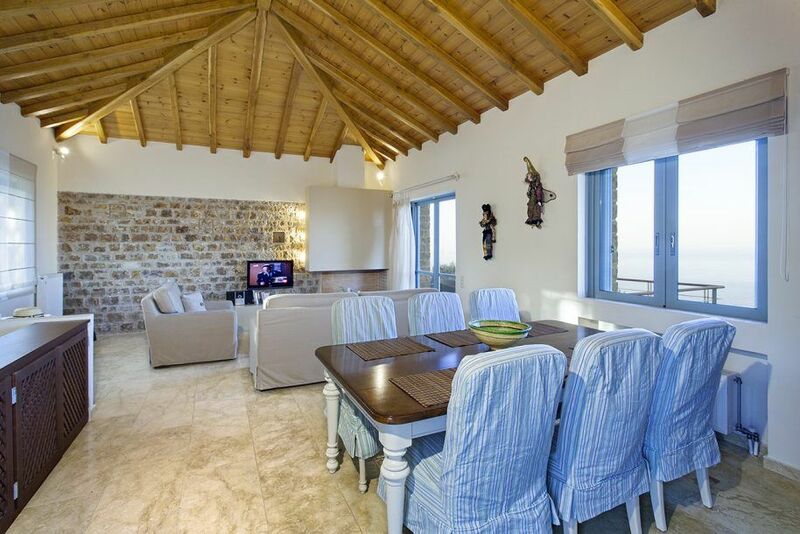 Both villas feature same architectural style, built in stone with wooden beamed ceilings and measure about 180 sq. 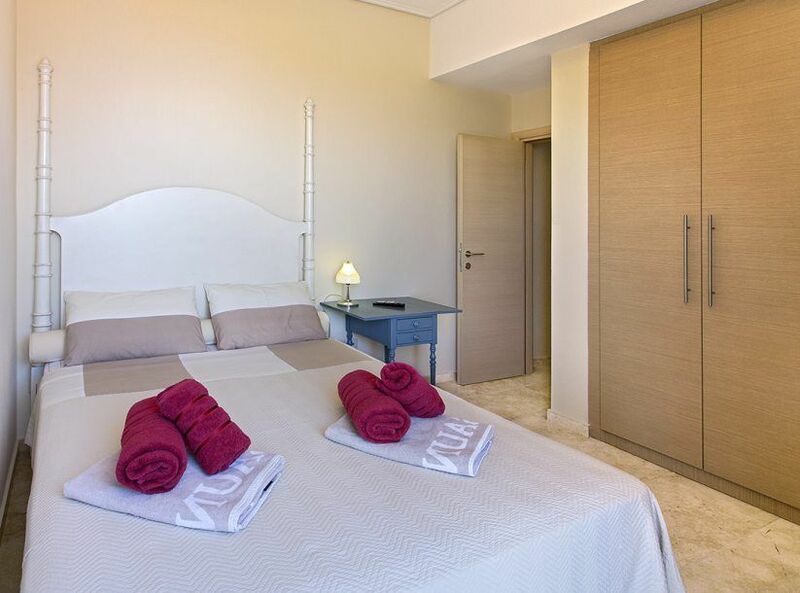 m. Comprising of two levels they each can accommodate up to 6 guests. 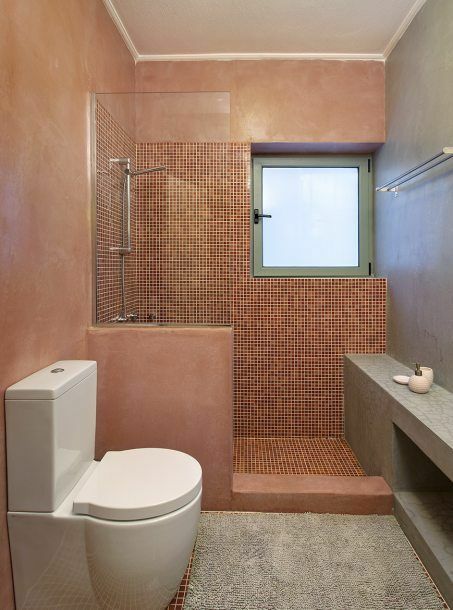 The interiors support pale, earthy colors that harmoniously match modern furniture. 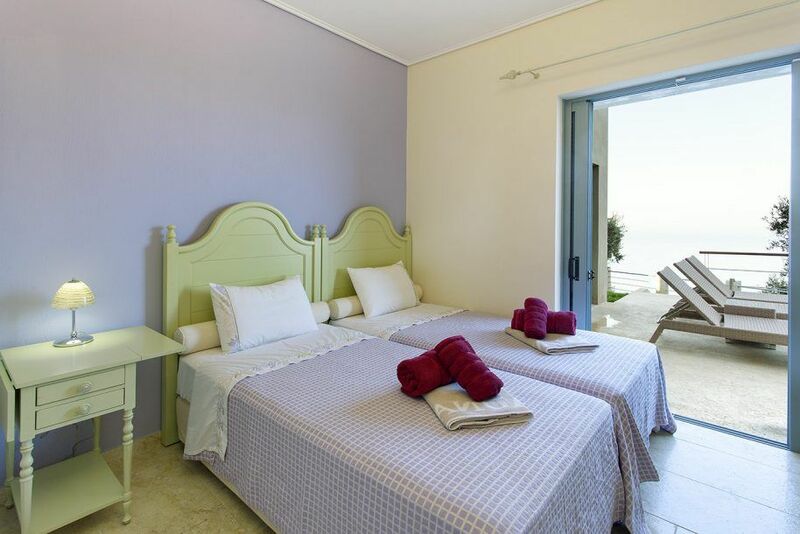 The ground floor offers 1 master bedroom with private bathroom (Jacuzzi tub) and 2 guest bedrooms, sharing a common bathroom. 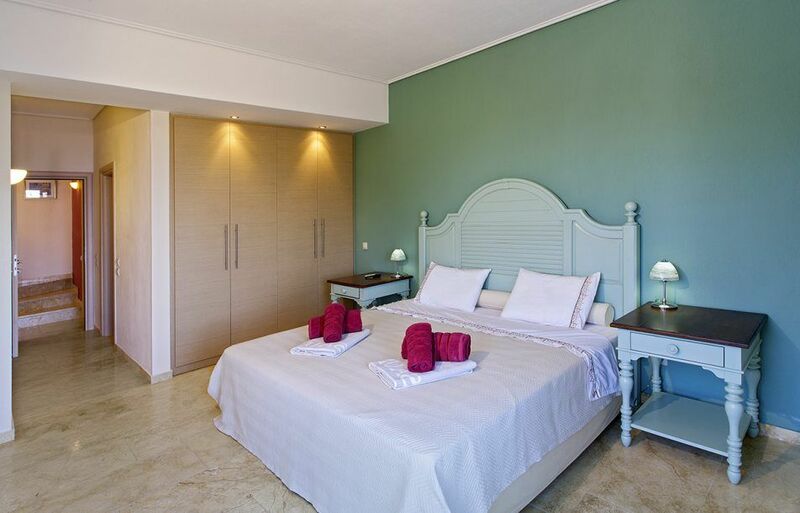 All come with air conditioning, ample wardrobes and broad windows. 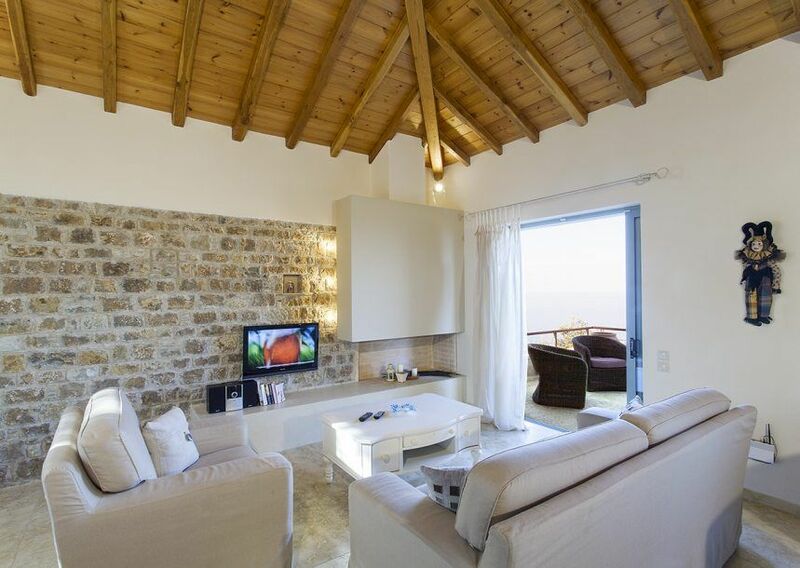 On the first floor you can find a spacious living room with cozy sofas, fireplace and TV. 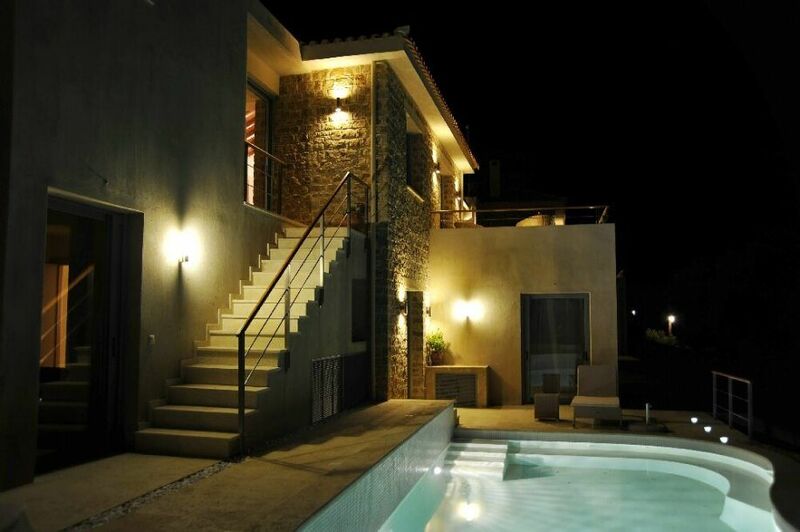 Internet access provided. 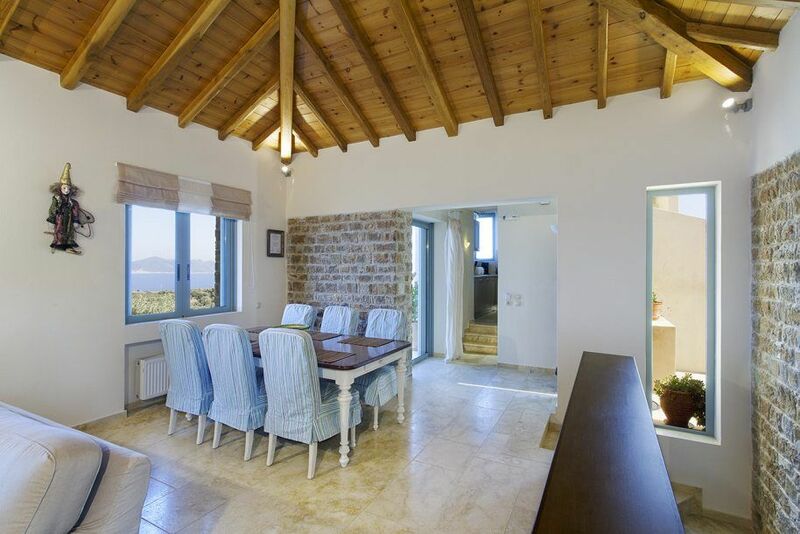 Linked to the lounge is the dining room and kitchen, which comes with full range of cooking tools and crockery and, moreover, it grants sea views. 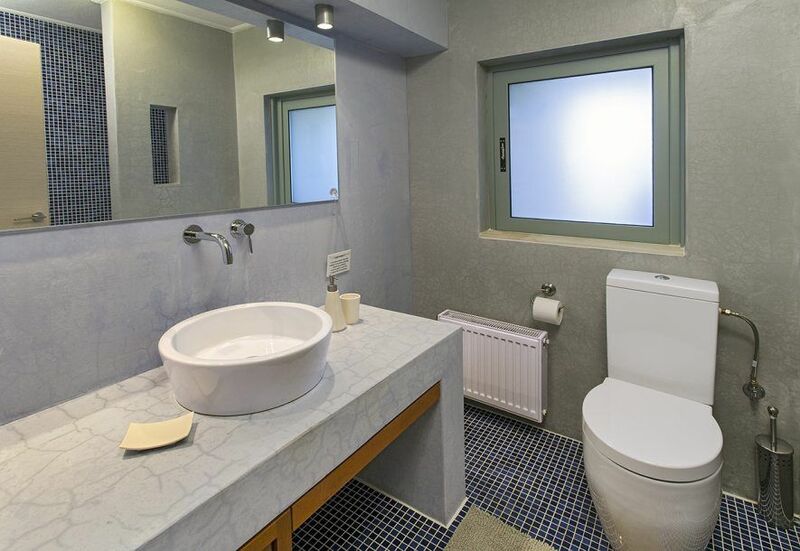 Same level also has a separate WC. 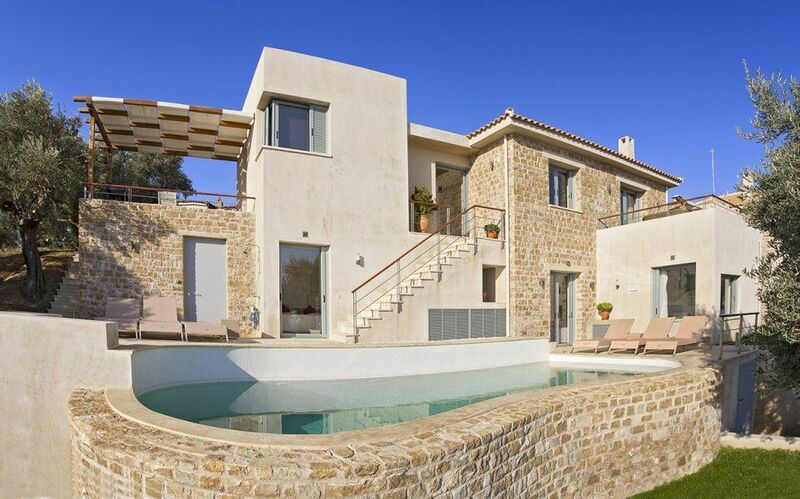 Living room has large patio doors, opening to the main terrace with private swimming pool. 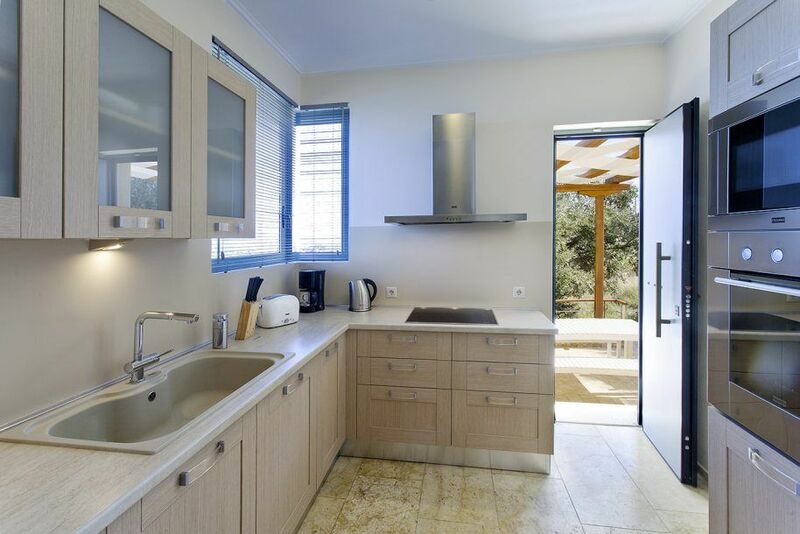 It is about 40 sq. 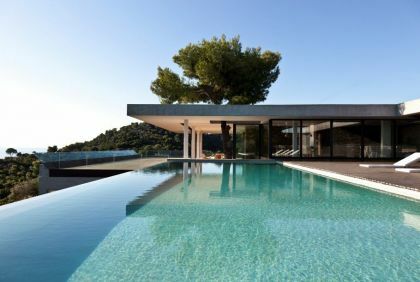 m. and has infinity edge, to create the feeling of water merging the sea. 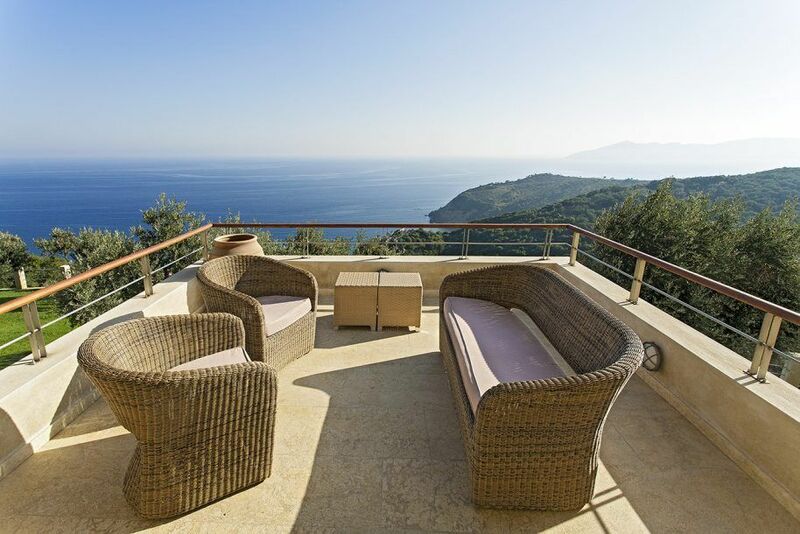 There is also a big sitting area with sunbeds, which is covered to provide shade during hot summer day. 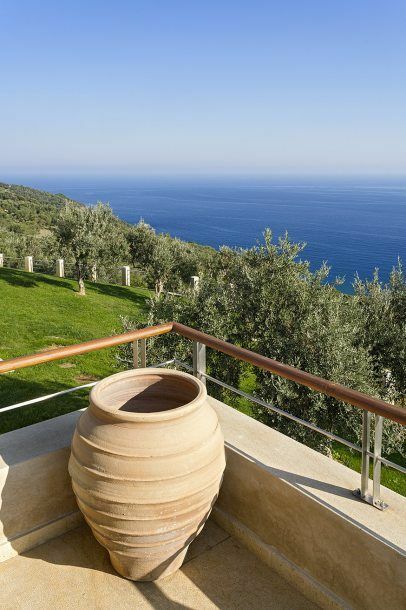 Needless to say, it has amazing sea views over the Aegean. 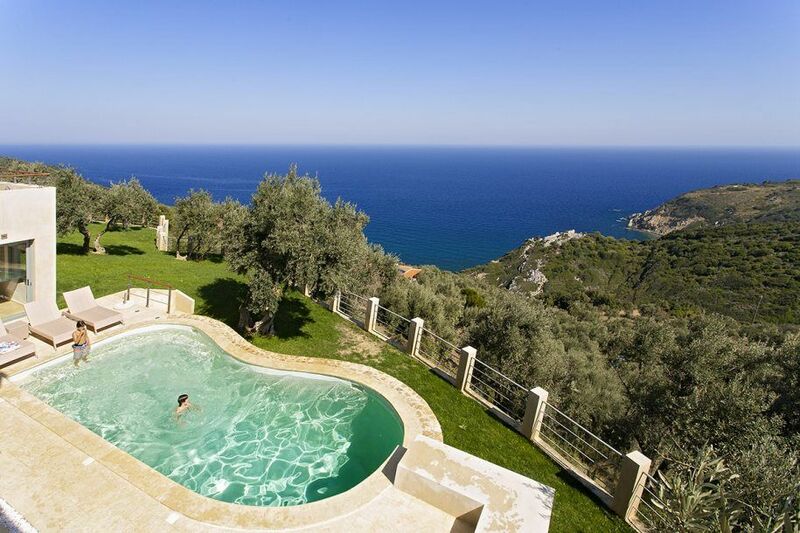 Apart from relaxing on the villa, highly recommended to rent a car and take a journey around the island. 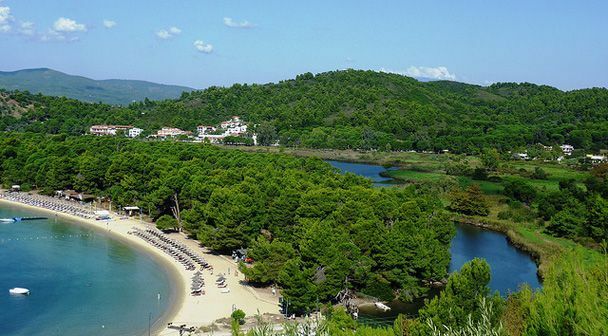 Visit the Skiathos main town with picturesque harbour and excellent tourist facilities, go to the Bourtzi, a small peninsula with ruins of a Venetian fortress, check the former house of a famous author Alexandros Papadiamantis, Church of the Annunciation of the Virgin Mary with its four museums and castle. 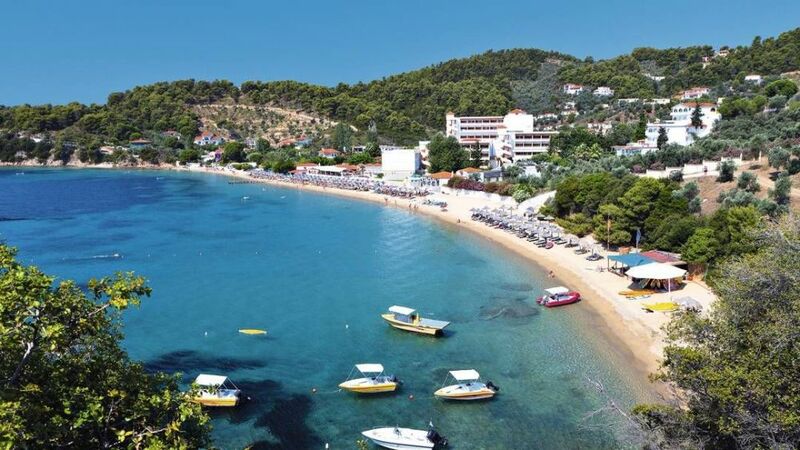 If you like, you can also rent a boat and go along the sea coast or try out some exciting sea activities!